Network Communications Inc. has sold Atlanta Homes & Lifestyles and two events, the Design Bloggers Conference and the Garden Bloggers Conference, to Esteem Media, Inc.
D+P client Network Communications Inc. has sold Atlanta Homes & Lifestyles as well as the Design Bloggers Conference and Garden Bloggers Conference to Adam Japko, president of Network Communications, Inc. (NCI)’s Luxury Home Design Division and DigitalSherpa, and his newly established, Esteem Media, Inc. Based in Boston, Mass., Esteem Media launched on Tuesday, September 2, to acquire and launch media properties in luxury lifestyle sectors. 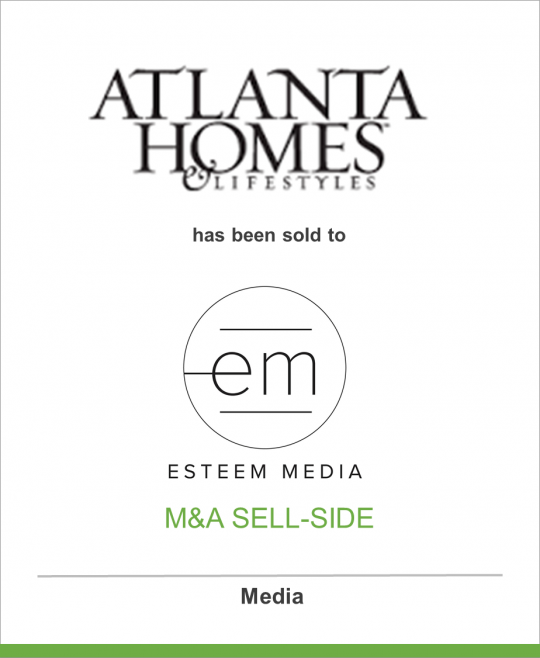 The first of Esteem Media’s acquisitions includes the Atlanta-based luxury design publication, Atlanta Homes & Lifestyles. Founded in 1983, Atlanta Homes & Lifestyles is the city’s only home and garden magazine, serving as the definitive guide to Atlanta style while heavily supporting the design community. Over the last decade, Japko has watched the city emerge as an epicenter for luxurious southern living. Additionally, Japko and Esteem Media have acquired two premier digital media conferences. The fifth-annual Design Bloggers Conference, slated for Wednesday, February 25, through Friday, February 27, 2015, will bring local and nationally acclaimed designers, bloggers, and social media marketers to Atlanta for design showcases and seminars. The Garden Bloggers Conference, also returning to Atlanta in 2015, is the only conference focused on the interests of garden and landscape designers deploying content marketing strategies across new digital media platforms. “Launching these events remains a centerpiece of my media career, and emceeing them in Los Angeles and Atlanta for the last five years is always a highlight. We are planning more in-person events that physically connect luxury-driven online communities with commercial and educational purposes,” says Esteem Media founder Adam Japko. With these three media properties, Esteem Media plans to begin its mission to build a strong portfolio and solidify its position in the traditional and digital luxury media sector. Boasting more than three decades of media expertise, Japko served from 2005 through mid-2014 as president of NCI’s Luxury Home Design Division and DigitalSherpa, a leading provider of content marketing and social media management for small businesses nationwide. Under Japko’s leadership, DigitalSherpa initiated and managed content marketing and social media programs for more than 4,000 SMBs since its launch in August 2009. Japko continues to provide advisory services to DigitalSherpa’s management team in an ongoing consulting role. Prior to joining the NCI team, Japko was president and chief operating officer of the Advanced Technology Division at PennWell Media Corp., a business-to-business information provider for the global technology, energy and municipal services markets. Japko also owns the award-winning wine-centric blog, WineZag. For more information about Esteem Media’s acquired properties, visit www.atlantahomesmag.com, www.design-bloggers-conference.com, www.garden-bloggers-conference.com and www.winezag.com.